TBSE Higher Secondary Exam Result 2019 for Class 12 students will be declared soon, as per the latest reports. Since the completion of the TBSE HS+2 Exams, students have been eagerly waiting for the declaration of TBSE Higher Secondary Exam Result 2019. TBSE HS Result 2019 plays an important role in the academic future of the students. Therefore, nervousness and anxiety among the students with regards to the TBSE Higher Secondary Exam Result date is natural. Tripura Board of Secondary Examination has not yet announced any official date for the release of TBSE HS Result 2019. However, academic experts have said that Class 12 students can expect the TBSE Result 2019 soon. 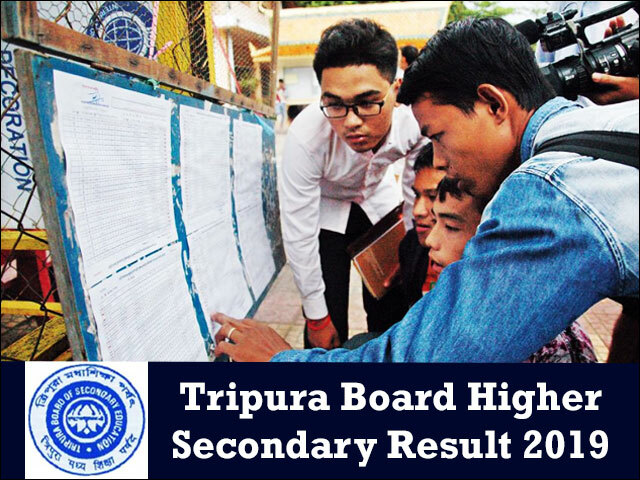 Reports have also suggested that the Tripura Board has begun the preliminary preparation for the announcement of TBSE HS Result 2019. As per the general trend, the TBSE HS Result 2019 will be declared online on the official website i.e. tripuraresults.nic.in. The final date for TBSE Result 2019 for class 12 students will be notified by the Tripura Board soon through an official notification. Our team will keep you posted about the latest development in this regards via regular updates here. Students can also receive important updates about Tripura Board Results easily by providing their email id and mobile number on this page. As stated above, the Tripura Board of Secondary Education (TBSE) has been completely silent about the declaration date of TBSE Higher Secondary Result 2019. However, our experts and academic pundits have hinted that the TBSE would follow the general trend and declare the TBSE 12th Result on time, as per their annual calendar. Generally, the TBSE Higher Secondary Exam Result 2019 date will be around the same time as it was declared last year. This claim is further corroborated by the fact, that this year, the exam datesheet was also similar to last year and the exam was conducted in accordance with the annual academic calendar. That coupled with the average time of around 30 to 40 days which TBSE takes to evaluation process puts the TBSE HS+2 Result date in the month of May /June 2019. However, this is merely estimation and the actual date for the Tripura Board 12th Result 2019 will be declared by the board soon. Students are requested to bookmark this page and visit it regularly to get latest news and updates about TBSE HS Result 2019. The statistical analysis of last year’s TBSE Higher Secondary Result can throw up some interesting insights for the students who are waiting for the declaration of TBSE HS Result 2019. These insights can help students gauge the strict evaluation process and build their expectations in accordance with that for the upcoming TBSE Higher Secondary Exam Result 2019. Students can take a look at this below given table and get a brief insight into the TBSE Higher Secondary Result for last year. Last year, the TBSE HS Result 2019 for Science Stream was declared first followed by the Result for Commerce and Arts stream. The key highlights for results for all the three streams are given below. Taking into account the various measures implemented by the TBSE to improve the standard of higher secondary education in the state, experts have suggested that the overall pass percentage for TBSE HS Result 2019 will increase. Students must remember that the TBSE Higher Secondary Result 2019 are made available online on the official website of the board only for their convenience. The final result along with the original mark sheet for the TBSE Result 2019 will be issued to them by the Tripura Board through official channels. Students can collect the original marksheet for the Tripura Board HS Result 2019 from their respective schools. What after TBSE Result 2019? TBSE HS Result 2019 is a turning point in the life of Class 12 students who will receive the TBSE Higher Secondary Exam Result 2019 this year. Keeping this in mind, it is important for students to develop the clarity of thought regarding the academic future that lies ahead of them. There are many career options available to the students after completing Class 12 Board exams, including a few new-age and off-beat career option. However, the percentage or marks that you score in your TBSE Higher Secondary Exam Result 2019 will play a critical role in deciding your future. Therefore, candidates can seek the advice of Jagranjosh.com experts and also read detailed analysis and career scope of different career options available to them by visiting www.jagranjosh.com/careers. Post the announcement of Tripura HS Result 2019, the TBSE will also notify the process of rechecking and re-evaluation for the students. The rechecking and re-evaluation process for Tripura Board 12th Result 2019 will be available for all the students from arts, commerce and science streams. The TBSE HS+2 Result 2019 rechecking will help alleviate any doubts in the minds of the students with regards to the evaluation process. Students can opt to get their marks re-totalled and check if any answers were left unevaluated through the rechecking option. While, through the re-evaluation process, the entire answer sheet for a particular subject will be re-evaluated for the students. For those students who have not done well in the recently announced TBSE Higher Secondary Exam Result or those who have failed in one or more subjects, the Tripura Board will also conduct the Compartmental / Supplementary / Improvement Exam soon. The Compartmental / Supplementary exam for Tripura Board HS Result 2019 is generally conducted in the month of June / July. This exam gives a second chance to the students to improve their academic performance in the TBSE Result 2019 without having to wait for it for an entire year. The detailed application process and other formalities with regards to the Tripura Board Compartmental / Improvement Exam will be announced soon. Established in the year 1976, the Tripura Board of Secondary Education (TBSE) is a state-level school board which is commonly known also by its acronym TBSE. Prior to the formation of TBSE, the West Bengal Board of Secondary Education held jurisdiction over all the High Schools and Higher Secondary Schools operating in the state of Tripura. The WBBSE also use to conduct the annual board examinations in the state i.e. High School and Higher Secondary School Examination. Tripura Board of Secondary Education took charge of managing the school –level education in the state in the year 1976. After formation, the Tripura Board started conducting the School Final Examination [old system], Higher Secondary Examination [old system] and MadhyamikPariksha (Secondary Examination) [new system] in the state. In 1978, TBSE introduced the Higher Secondary (+2 stages) Examination [new system] as part of the school-level education. In addition, the TBSE also prescribes syllabus, releases date sheet and provides affiliation to different schools in the state. The Tripura Board of Secondary Education (TBSE) has announced the TBSE Class 12 Commerce and Arts Result 2018 today on the official website of the Board i.e. tripuraresults.nic.in and tbse.in. This year, the Tripura Board conducted the TBSE 12 examination 2018 (Commerce and Arts) from 8th March to 11th April. The Tripura Board HS Result 2018 for the Arts and Commerce Streams has been declared on the official website, i.e. tripuraresults.nic.in. The Tripura Board HS Result 2018 for the Science stream has been declared on the official website, i.e. tripuraresults.nic.in.